Although it seems a complex game, if the standard craps rules are understood, it can be a simple process to learn how to play craps. Here we try to take the game at its simplest and show you the do's and don'ts; remember though, nothing beats the experience of going out to a casino and watching the craps table for a good hour, even playing our free game isn't as good. By the time you've read this page you should feel comfortable enough to walk up to a craps game in progress and place an appropriate bet. In essence craps is a game where players either bet on a shooter making their "point", or not making their point. You bet with the shooter when you bet on them making the point, and against the shooter when you bet on them not making the point. The shooter throws two six sided dice from one end of the craps table to the other. Most casinos require that they are thrown with enough force to bounce of the back wall. This is done so that dice setters don't win an unfair advantage (the process of throwing a set of dice from a certain position at a certain velocity in hopes to hit a certain number more times than standard odds would suggest). To bet a pass line bet with the shooter you place your bet physically on the pass line. Bets must be placed before the shooter lets go of the dice. The pass line is the wide band usually labeled with a capitalized 'PASS LINE' that runs along the outside of the table layout. To bet against the shooter you place your bet on the don't pass line. As you can see in our game table graphic, the don't pass line runs along the inside of the pass line and is noticeably narrower. A simple pass line bet works like this: You place your bet on the pass line before a new shooter begins their roll. Physically, you simply place your chips in the middle of the big band labeled the pass line. If the shooter rolls a 7 or 11 you win. If the shooter rolls a two, three or twelve, you lose. If the shooter rolls any other number, that number becomes the point number. If you're betting with the shooter, you want them to roll that number (the point) again before a seven is rolled. If that happens, you, and the shooter win. If a seven is rolled before the point number is rolled again, you lose and the shooter lose. The process begins again when either a seven is hit, or the point is hit. For the come out roll, or the first toss for a new shooter, the player wants to hit a 7 or an 11 because it's an instant win. They want to avoid a 2, 3, or a 12 because it's an instant loss. The great thing about craps is you can jump into the betting any time; the only exception to this states that you can't bet the "pass line bet with odds" on the come out roll - which is simply because you can only bet with odds when the roller is going for the point. A pass line bet with odds is when you're making a pass line bet on the point, and then placing an extra portion of money down just below your bet (more precisely, half over the bottom bar of the pass line, so half on half off). This 'odds bet' pays off slightly higher than the 1 to 1 the pass line pays. Basically if you've understood this, you can learn how to play craps. If you're planning on visiting a land based casino in the near future, I would highly recommend you take in one of the 'learn how to play craps' classes frequently offered at most casinos, avoid the otherwise inevitable bottle of prozac. Casinos understand how much craps is enjoyed by their patrons, and as such it's a great game for keeping people in the casinos. The more people who know how to play the better, so you shouldn't have any trouble finding some free instruction at a casino near you. If however you're like me and getting to Vegas isn't an easy option, you might try online play. If this is the case then online is where you're going to look to learn, and this should be the site you come to first for a little instruction. 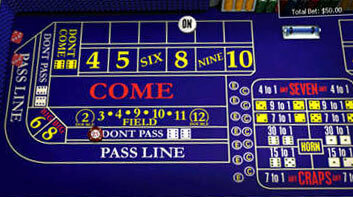 Because of the multitude of places to bet on the craps table many novice players are intimidated and refuse to learn. If this sounds like you, its time to get a new attitude because you're missing out big time. If you think you'll never know how to play craps, have another read over this page and then give our free craps game a try. More details of not so common bets can be found in our craps strategy section.